IMPORTANT: This software is only for use with the products identified and sold in Vietnam. Not all models are sold in all countries. Navigate to Settings and press ⊕ to select it. The version number is shown on the Software Version row. All of user settings will be kept. Can I install an older version of software? 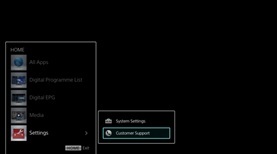 Installation of older software is not supported to ensure your TV set remains at optimum performance. It is normal for the TV set to restart during the update process. You may experience the TV set taking a longer than normal time for it to restart as it is installing the new software update. You need to agree with the disclaimer before downloading the file. Please read all the information carefully and thoroughly before downloading and installing any file. Failure to follow the instructions may cause the TV set to be unresponsive or to require repair. After you have accepted the Terms & Conditions, download the file to your computer desktop. Depending on the network environment, the download may take significant time. Go to the directory where the file was downloaded and verify that the file size is 144,802,401 bytes. Right click the file, select properties and check that the General tab. Open Windows explorer, locate the downloaded file sony_tvupdate_2016_1302_dmf_auth.zip and unzip it. 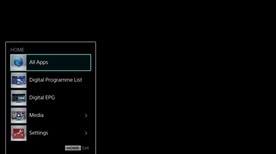 A folder sony_dtv02B30B06B3B6_00101201 will be created in your local drive after unzipped, then copy it to the root of your USB device. The update will not be performed if the folder structure, name of the folder, or name of the file inside the folder is modified. Playback via USB” (Photos, Music and Videos) is one of “BRAVIA” TV feature. If the USB works with that feature, it also works Software Update. Insert your USB device containing sony_dtv02B30B06B3B6_00101201 into the USB slot located at the side of the TV set. Navigate to Settings → Customer Support → Software Update. During System update, the LED indicator slowly flashing amber. After several minutes, the Software update complete message displays. And the TV will turn off automatically and then turn back on to complete the update. CAUTION: During the software installation process, do not remove the USB device, or switch off the TV set or remove the power. After the TV turn on, Safely remove your USB device from the USB slot. Navigate to Settings and press ⊕ button to select it. 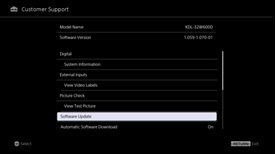 If the version number shown on the bottom line is v1.302 your TV set has been correctly updated. "No newer version of the TV software was found" is displayed on the TV front panel display. Your TV set already has newer software installed.